Our administrative assistant Lindsey is off for the summer from June 29 to September 4, 2018. We will send you all the details for the start of school in late August. Office hours will resume on September 4th. Preschool classes begin September 10th & 11th. If you wish to register your child over the summer, you can do so online – just click the orange button above and to the right. We may not respond with your class placement immediately (Lindsey will be out of country July 2-12) but registrations will be processed in the order received, and we will be in touch as soon as we can. As of June 29, our morning 3yo classes are full with a waitlist. You can email questions to info@canmorepreschool.com. We will check email approximately once a week during the summer. If you require urgent assistance you can call our volunteer Board Chairperson, Rachel Lippitt – (403) 675-4045. Thank you and enjoy the summer! It’s hard to believe that there’s only one month of school left before the summer break! We have another month of music classes with Tangle, visits to the Library, Rainbow Day, Teddy Bear Picnic, and plenty of outdoor time. Then on Friday, June 22nd, please join us from 10am to noon in Lions Park for our End of Year Party. Please arrive at 10, because Ms. Tangle will be giving a concert/puppet show including some of your children’s favorite songs from Preschool, perfect for all of us to sing and dance along with the music. Let’s keep our fingers crossed for good weather! If the weather doesn’t cooperate, we will have a back-up location booked. We will send out an email to all families on the morning before the party if we need to move to the back-up location. We have many little teapots, hear them shout ♥ Tip them over and pour them out! We will be pouring tea for all preschool moms, May 8 to 11. Please drop off your preschooler at the earlier time listed for them to help set up for the party. Moms, please be on time for the party itself. Kindly make other arrangements for siblings. We hope this will be a special time to share with your preschooler! Registration for 2018-2019 is ongoing! If you haven’t registered yet, the sooner the better! To register, click the orange button above and to the right. You can call our office at 403-678-2538 (M-Th 8:30-3:30) or email info@canmorepreschool.com with questions or to find out current availability. We hope to see you in the fall! Rocky Mountain Raffle 2017 – Congratulations, Winners! Heartfelt thanks to all of our sponsors! Thank you, Bow Valley and beyond 🙂 And last but definitely not least, our thanks to everyone who bought and sold tickets. We appreciate it! We are pleased to have hired Julia Freeman at the new Artisans Market Coordinator. Welcome, Julia! Thank you to all who applied. Are you friendly, detail-oriented, organized, and interested in art and quality craft? 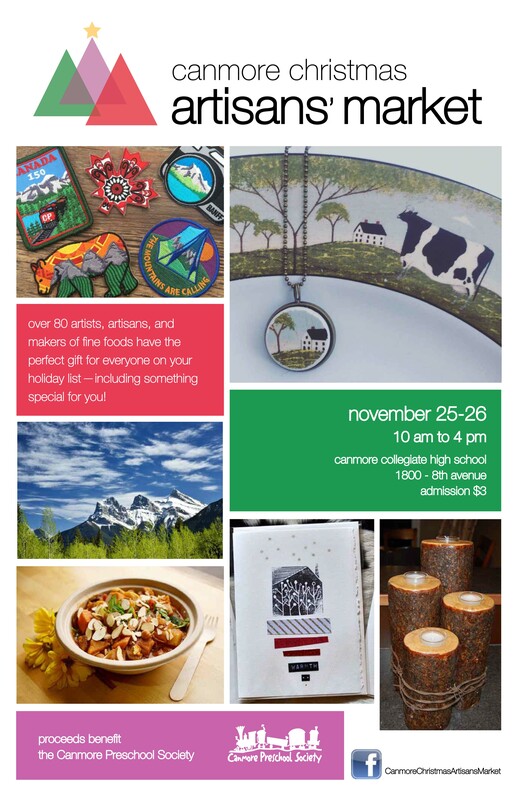 This year will be the 22nd annual Canmore Christmas Artisans Market and we are seeking a new coordinator to take over the helm and maintain the market’s position as a much-loved community event. This is a very part-time position, except during the third week in November. Register for 2017-2018 online now – and attend AGM on March 1st! You may now submit your registration for 2017-2018 by clicking on the orange button above and to the right. Families who attend our AGM & Registration Night at 7pm, March 1st, at the Holiday Inn (1 Silvertip Trail, Nakiska Room) are placed in classes before those who do not attend. So please remember to come to the meeting! We will keep it short and sweet. After the AGM, registration is first come first served, if there are still spaces available. Before we can make class lists in March, we need to have a full board of volunteers for 2017-2018. Here are descriptions of available positions. Board members’ children are guaranteed their class placement, and it fulfills your volunteer hours, so give us a call to join the board! Raffle tickets are on sale now! $5 per ticket, only 2,000 printed, and 10 fantastic prize packages to win. Preschool families are asked to sell at least one book of 10 tickets. Everyone who sells two books will be entered in a prize drawing for a $50 gift card to Save-On-Foods plus a Tim Horton’s gift basket. Playmobile Pirate Ship and Clubhouse from Hijinx Toys worth $200, plus a $10 gift card to Craig’s Way Station. $25 Gift Card from Safeway, plus a $10 gift card to Craig’s Way Station. Free Small Pizza at Red Rock Pizza, plus a $10 gift card to Craig’s Way Station.